Like people today, nineteenth-century Britons lamented the exorbitant fees doctors billed. These caricatures deal with the high costs associated with health care. 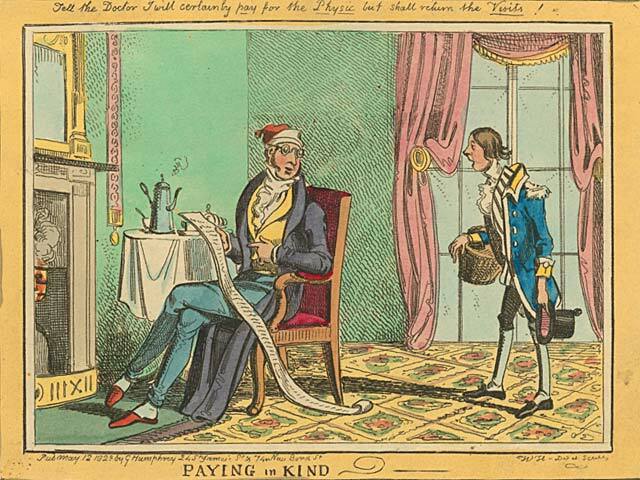 In the amusing cartoon, “Paying in Kind,” the doctor’s bill for medicine and house calls is so long that it trails on the ground. 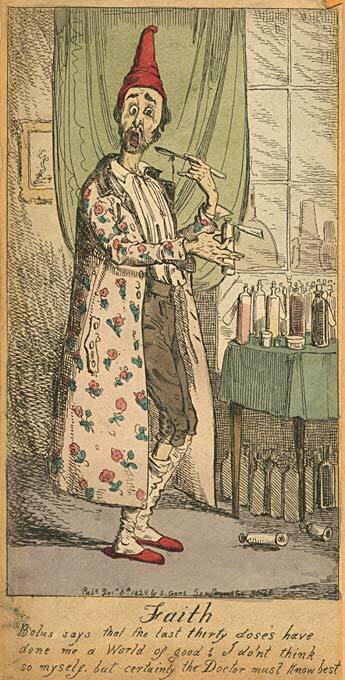 In “Faith” the caricature mocks the sheer quantity of medicine prescribed by the patient’s doctor. In the more thoughtful and provocative caricature, entitled “The Blue Devils,” the artist explores a melancholy world ushered in by debt, principally to the physician. Images of death stalk the beleaguered man, and the doctor serves as death’s deputy. Paying in Kind. Anon, published by G. Humphrey, 27 St. James’s Street & 74 New Bond Street, W.H. Del & Sculpt, May 12, 1828. Faith. Anon, published by S. Gans, Southhampton Street, December 6, 1829. The Blue Devils!! George Cruikshank, published by Thos. McLean, 26 Haymarket, August 1, 1835. In this intricately detailed print, Cruikshank brings us into the life of a forlorn, solitary figure sitting hunched over a barren hearth. The drawing, entitled “The Blue Devils,” describes the depressed world of the protagonist. Three pictures hanging on the back wall symbolize the man’s life careening out of control. A devilish creature wielding a fiery paintbrush adds his own special touches to the artwork. The first painting depicts a boat sinking in a ferocious storm at sea. In the second, flames burst from a burning building. The final picture, this one not yet framed, shows a sketch of a man similarly dressed and posed as our protagonist. Behind him is an angry woman, presumably his wife, about to strike him over the head with what looks like a metal bed warmer. All around the poor man there are imps and symbols encouraging him to choose death over life. A little devil on his shoulder holds a noose over his head. Another, hanging from the mantle, offers a knife. Yet another imp in the fireplace blows smoke out of his ears, while a monster with white fangs hungrily looks up from underneath the chair. 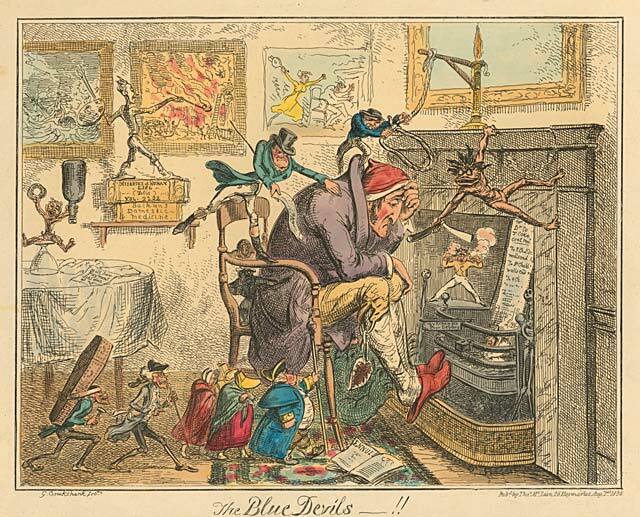 Cruikshank even draws the andirons to resemble skeletons. The protagonist falls into such depths of despair due to his inability to surmount the debts that have piled up around him. A sign hanging on the fireplace says, “PRAY REMEMBER the POOR DEBTORS.” A gentleman taps the debtor on the shoulder to give him a bill as a thief picks his pocket. Other debts appear to be doctor’s bills. In the fireplace, the bill has faint traces of the word “Dr.” written on it. On the table stacked with bills, an imp holds an empty medicine bottle and shouts with glee. On a shelf, a devilish creature stands on two books: Miseries of Human Life, Vol. 2,222 and Buchan’s Domestic Medicine. The man’s fate looks grim as a fat, pompous magistrate leads a procession of mourning women and two evil men, one with a coffin strapped to his back.